Guys, it is time to leave tradition behind. I know how important your wallets are to you, but carrying around a bulky bifold or trifold has long past its prime. However, not only is it not IN to own a traditional wallet, but it comes with plenty of repercussions as well (bad backs are just the tip of the iceberg). Therefore, I have decided to present you with ten items I consider being the best slim wallets on the market. Yes, slim wallets are the answer, and here are a few tips and tricks on how you would go about choosing the best slim wallet for you! Slim Wallets Are The Answer, Seriously? Sheesh, not only are they the answer, but a lifesaver as well. In the name of truth, for once, let us just admit that we tend to overstuff our wallets. How many times have you found some shockingly old receipts, business and membership cards, simply lying there, waiting to never be used again? Mature and responsible people are aware of how important being organized is. I say it is time to become responsible. It is time to get a slim wallet. I Know What I Like, Can Slim Wallets Deliver? You betcha! No matter what wallet features you are most into, rest assured that there is an item out there waiting for you to discover it. If you are a person who enjoys leather essentials only, you will be happy to know that there is an array of leather slim wallets on the market as well. Alligator leather, cowhide leather, be it top or full grain, just pick your poison. Of course, if you prefer not interfering with animal skin products, you are more than welcome to choose a polyester or aluminum framed wallet. On a different note, if you are a handyman, like me, and are interested in a slim wallet multi-tool, you too have a reason to celebrate. Luckily for us, there are a few multi-tool wallets on the market which are incredibly practical to use as well as beautifully designed. But, instead of me going on about them, just check out the Dango Wallet. All will be revealed to you! However, be prepared to have your world turned upside down. What I am essentially trying to say is, do not worry about the lack of diversity on the market. There is more than enough options to choose from, no matter what you are into. Trust me. But, Why Should I Buy a Slim Wallet? Hm, where do I start from? Well, in the first place, minimalist wallets are becoming trendy, much like phone cases with wallets If you are looking not to be perceived as an old-school guy or “out of fashion”, settling for one might be the right way to go. The second reason will strike a chord with everyone who is into minimalism. Slim wallets for men, due to their compact nature, prevent you from carrying around redundant things in your pockets. They force you to say goodbye to numerous unused business and credit cards, bills, receipts, etc. Consequently, what you end up in your pockets with, are only the essentials. Just a few credit cards and a bit of cash. Do you even need more? Not having an overstuffed wallet helps in many different ways. Now, just picture this situation (which has happened many times before) – You and your buddies have just had a meal. It is time to go. You get up to pay the bill, but you are struggling to find your credit card. Eventually, when you do find it, you try to pull it out, but it is just stuck. What you end up doing is pulling to hard and spilling out your deck of credit cards all over the floor. Apart from avoiding such an unwanted scenario, a slim wallet would also help you keep your back straight and in good shape. Even though a regular wallet is not extremely heavy, wearing it in your back pocket does take a toll on your back. Especially when you are sitting on it. Lastly (even though there are many other reasons to mention), slim wallets provide an additional level of security. You would usually wear your traditional wallet in your back pocket because you would barely be able to walk with it in the front pocket. That is the perfect scenario for thieves. It is so much easier to steal a wallet from the back pocket. That is exactly the reason why slim wallets are safer than traditional ones. Slim wallets are made to fit front pockets, no matter how tight your jeans may be. 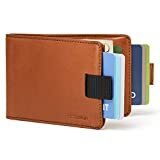 What Makes The Best Slim Wallets? As you may suppose, not all minimalist wallets out there provide good value for money. That is simply the nature of the beast. However, there are a few features worth looking out for which separate regular, mediocre slim wallets, from the ones that are almost necessary to have. Technology progresses all the time. That means that manufacturers have to keep up with the latest technological innovations in order to provide their customer with an adequate level of safety. When it comes to wallets, RFID protection is of utmost importance. Computer savvy thieves have ways of stealing your personal information by utilizing electromagnetic fields. Therefore, RFID (Radio-frequency identification) blocking is a feature you would want your wallet to have. Furthermore, in order to make your life easier, be on the lookout for a credit card pull-tab, easy access window, and a money clip. If you think about it, minimalist wallets are mostly designed to carry your credit cards in. No matter how conveniently designed they may be, reaching out for your credit cards is not always as simple a task as it should be. That is why pull-tabs and easy access windows are blessed features. Pull-tabs allow you to easily slide your stack of cards out by utilizing the provided strap, whereas easy access windows do the same thing, but instead of the strap you use your fingers to slide out the cards. The money clip is self-explanatory. Most of us still use cash as a payment method. What good is a wallet when it does not provides space for it? Of course, that is not all. Other features like an ID window are also extremely useful to have. Just know that it all boils down to you. What you need and like. There are not too many companies on the market which are as reputable as Alpine Swiss is. When you see that red, flag-based logo, know that you are witnessing something special. In case you are looking for a wallet that breathes elegance, quality, and practicality, Alpine Swiss front pocket simply has to be among your top choices. Since it is made from 100% genuine leather, longevity will never show up as a potential problem. All of us have had previous experiences with traditional leather wallets, and we know how long they tend to last. However, unlike most of them, Alpine Swiss have figure out a way to make leather wallets in more than just two colors. In fact, you can choose between eight! Moving on to the features. First of all, this is a magnetic money clip wallet. The magnet itself is strong enough to safely hold in place at least ten bills, but not as strong to be able to mess with and damage your credit cards. That is good know. Additionally, it provides enough space to store up to six credit cards in the three compartments on the front side. The backside of the wallet is where the ID window is. This little feature comes in very handy when the police pull you over. With the Alpine Swiss, you just get to flash it. THIN & COMPACT – This small and thin spring clip (not magnet) wallet measures 4″ x 3 1/8″ x 3/8″ and fits perfectly in your front or back pocket. FUNCTIONAL – Our slim design is stylish, sleek, and functional. 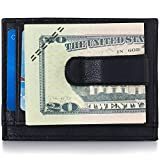 Featuring 3 card slots, 2 larger pockets for cards or receipts, 1 ID window with thumb cut out, and a classic spring money clip to secure your cash. STYLISH – A convenient and modern alternative to a traditional wallet with room for all of your essentials. Available in a variety of colors, we have the perfect wallet to match your personal style. Alpine Swiss emblem outside and debossed logo. BUILT TO LAST – Our innovative minimalist design is crafted from the finest genuine leather to ensure your wallet ages beautifully and stands the test of time. IDEAL GIFT – Comes neatly packaged in our Alpine Swiss 100% recycled giftbox. I love it when a wallet is modern and elegant at this same time. Made from 100% top grain genuine leather, the Travelambo not only looks incredible but is fiercely durable as well. From the looks of it, you would be able to wear it on all occasions regardless of how formal or informal they might be. Every single detail on it looks great. Even the stitching is up to par. One of the most notable features of this slim wallet is the RFID protection it provides. As long as the cards operate in a 13.6 MHz frequency they will be safe and secure (our credit cards, IDs, and driver’s licenses usually do). Some models of the Travelambo slim wallet , like the Crosshatch black model, have a built-in ID window! On the other hand, some other models come with an easy access window. It is so great to see when a manufacturer does his best to offer all the necessary features a product should have to its customers. When it comes to storage, the Travelambo provides enough space to safely tuck away up to 10 credit cards. In addition to that, it also includes two top pouches which are perfect for keeping your cash in. 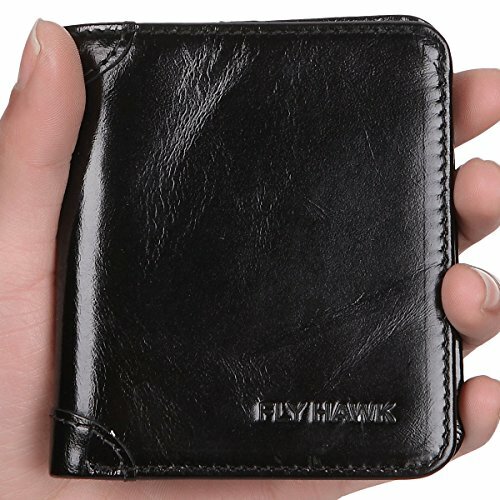 GENUINE LEATHER – Made with the Finest Full Grain genuine leather,looks classy and very slim, Wallet Size: 4″ in. x 3″ in. .4″ in. Sometimes, everything a man needs is a simple, sleek looking, minimalist wallet. That is exactly what the Radix One is. It does not come with a ton of different features, but it still does practically everything a slim wallet should do. It protects your back by being extremely light (weighs less than one ounce), you can shove it into your front pocket and hide it from the hands of pickpockets, and most importantly, it forces you to pack only the most necessary things. As far as its features are concerned, it has a polycarbonate plastic frame and a silicone money clip band. Nothing more, nothing less. The makers of this wallet guarantee that you would be able to fit between 4 and 10 credit cards in it. However, when you do try it out, it feels as though you should place at least 6 credit cards in it for them be safely held in place. Color-wise, you get to choose between 3 different frame colors (black, smoke, and white) and 5 different band colors (black, red, cyan, dark blue, and gray). Basically, you get to choose the most preferable combination for you. Just WOW. I am honestly tempted to say that slim wallets do not get much prettier than this. If you are a classy guy looking for the classiest of wallets, I think you have just found your match. Made from genuine top grain Italian leather, this accessory was made to last and impress. Six colors are available to choose from – black, brown, carmine red, chromium gray, cognac, and navy blue. Is this not the best credit card wallet you have ever seen? Nonetheless, it is not just about the looks with this wallet. In fact, it provides more credit card space than a lot of other alternatives on the market. The front pocket is big enough to accept 2 credit cards, the largest central pocket can fit up to 5, and the back pocket can take no more than 3. That makes a total of 10 credit cards. Of course, you are more than welcome to store your cash in any of the aforementioned pouches. Keep in mind that only the middle one is RFID protected. Lastly, I have to mention this wallet’s most important feature. The Vaultskin Chelsea comes with a smartly designed pull-tab. It allows you to seamlessly access your credit cards. Best of all, it automatically retracts when you let it go. So simple, yet so effective. REFINED & STYLISH – Designed in Britain to best combine elegance, comfort and convenience. Chelsea minimalist front pocket wallet is made of luxurious top grain genuine Italian leather, which is both soft and durable, ensuring a sophisticated feel and look. RFID BLOCKING – Our high-end RFID blocking insulation prevents electronic pickpocketing; your credit cards are protected from RFID theft (specifically 13.56 MHz RFID / NFC standard). Feel safe when you travel. FUNCTIONAL & SLIM – Chelsea’s three pockets hold up to 10 cards: 1-2 in the front pocket, up to 5 in the inner RFID protected pocket and up to 3 cards in the back pocket. 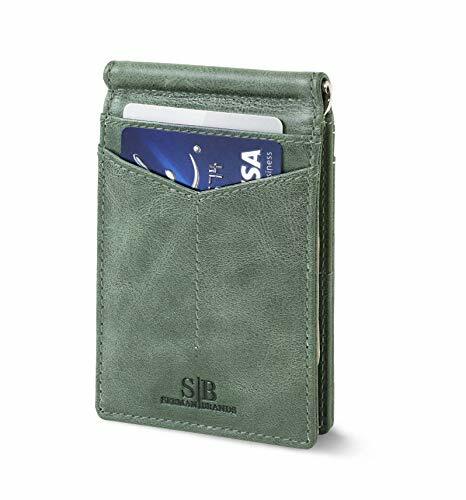 The slim wallet is ideal for carrying business cards, credit and debit cards, driver’s license etc. SMART STRAP – The smart strap allows you to quickly access your cards. The strap automatically retracts back into position when released. PERFECT GIFT – an exceptional wallet for men of all ages. This men’s wallet is a GREAT BIRTHDAY GIFT idea and comes beautifully packaged in a gift box. Here is another interesting example of how ingenuity makes the world a better place. Distil Union has created a slim designer wallet which is packed with awe-inspiring features. Let us first start with the most basic information. The regular Wally Bifold is capable of storing up to 12 credit cards and some 30 bills. Yes, it comes with a money clip which holds the cash in place without bulking up the wallet. You can also get the RFID version which secures additional space for 2 credit cards (14 in total). Also, the wallet is made from premium, sustainably sourced, full-grain leather. That is exactly why it comes with a full one year warranty. It is built to last. Moving on to the more interesting stuff. This wallet comes with the so-called FlexLock pockets. Basically, when you press the pockets they actually open up, allowing you to easily access your credit cards. However, when you let go and the pockets go back to their original state, they are so tight, that it is practically impossible for the cards to ever fall out. That is not it. The wallet is fully NFC compatible. That means that you will not even have to pull out your contactless cards to make payments. Internal money-clip eliminates excess bulk while keeping your cash discreetly in the center. The pull-tab design makes it easy to pull out your cards without flashing your cash, and slim enough to fit in your front pocket! Every wallet is built to last and comes with a one-year no-hassle warranty. If you are not 100% satisfied, reach out to our customer service and support – we’ll do whatever it takes to make it right! It makes me happy to see that some manufacturers are still insisting on rustic wallet designs, and quite frankly, the Bryker Hyde Quick Draw is as rustic as they come. It is made from full grain distressed leather offered in 8 different colors, all of which are sold as two separate versions – with the ID window inside or outside. Apart from looking rustic and classy, the Quick Draw is also made to last. Not only does the distressed leather body make it tough, but its coated edges secure an additional level of protection from any potential wear and tear. 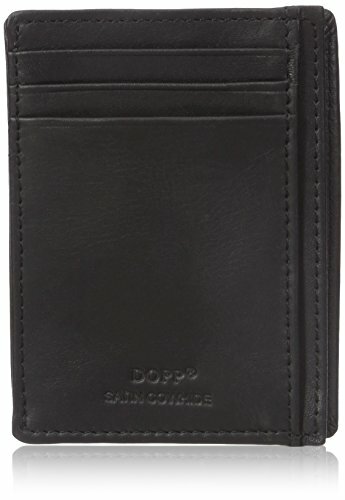 Compartment-wise, this slim wallet provides 1 large and 8 card pockets, which is the optimal amount. You also get an ID window with the ezthumb hole, a feature that allows you to slide out your ID card without breaking a sweat. 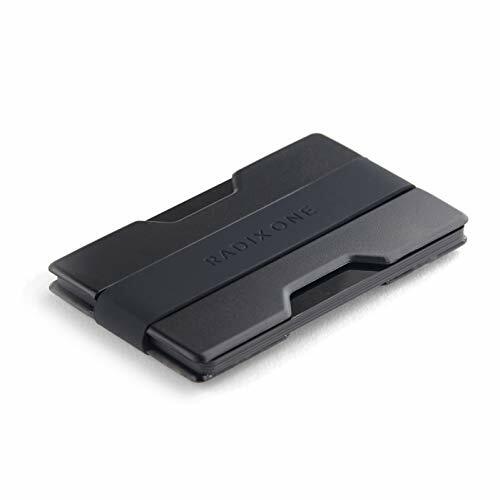 RFID blocking is something that the Quick Draw also includes, as well a removable money clip. 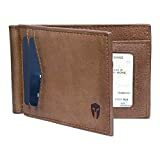 In order to accentuate how much they believe in the quality of their product, Bryker Hyde gives out a lifetime warranty for each and every wallet they sell. ELITE FEATURES: 7 Card Slots (1 has the ID Window) and 1 Larger Card/Money/Receipt Pocket – Money Clip can be removed and entered from Top or Bottom to suit your Preferred Choice. For both Left and Right Handed use. LIFETIME WARRANTY and 100% MONEY BACK GUARANTEE: To receive our Lifetime warranty, 100% Money Back guarantee and Quality guarantee you must purchase from Avendale Mall. It will say “Sold by Avendale Mall and Fulfilled by Amazon”. Purchases from any other unauthorized seller under this listing will not qualify. Thank you for your understanding. Here is a special little wallet. Created from custom produced Soft Shell material (combination of Kevlar and GORE-TEX) the SlimFold Minimalist Wallet is probably the most durable accessory on the market. 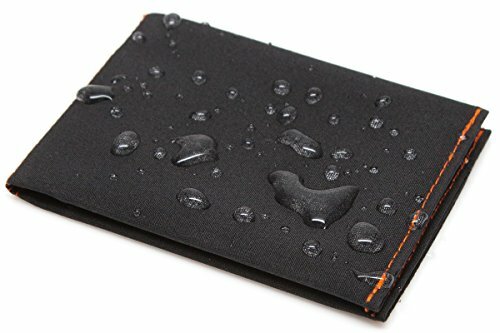 On top of that, it is also waterproof with stain-resistant interior lining! SlimFold guarantee that the Soft Shell material is more abrasion resistant than leather! Unlike other slim wallets, the SlimFold has a bit of a wider profile. That can sometimes be a problem if you are accustomed to wearing very tight jeans. On the other hand, it is extremely light. In fact, it is so light that you sometimes forget that you have it on you. Apart from being built from very smart materials, the SlimFold provides enough space to store up to 12 credit cards. I should also point out that one of the interior pockets has an ID window as well. The money pocket is large enough to fit multiple different currencies as well as some receipts. Also, if you pay an additional $3, your wallet will be equipped with RFID protection. Simple, elegant, practical, and stylish. That is how you would sum up this great little wallet. It is made from full grain leather and it is being sold in seven different colors (California desert, canyon red, charcoal black, chocolate, jet black, mahogany, and Texas brown). In this day and age, our privacy has to be protected at all times, and that is why the Serman Brands minimalist wallet is equipped with the latest RFID blocking technology (blocks 13.56 MHz or higher signals). Apart from that, it also includes an ID window which will prove itself as being one of the most useful features your wallet could have. Also, while we are at useful features, this wallet is equipped with a pull-tab which allows you to access your everyday cards with much more ease. In addition to all of this, the front pocket (which is made for your most used card) has an easy access opening, you get two internal pockets capable of storing up to 8 credit cards, and a cash pocket. In case you end up being unsatisfied with the product, Serman Brands offer 100% money back guarantee as well as a full one-year warranty. PATENT PENDING – 12 MONTH WARRANTY, The SERMAN BRANDS Warranty covers any factory defects as a result from the manufacturing process of the product. The warranty is non-transferable and only valid to the original buyer for purchases made directly from SERMAN BRANDS on Amazon. 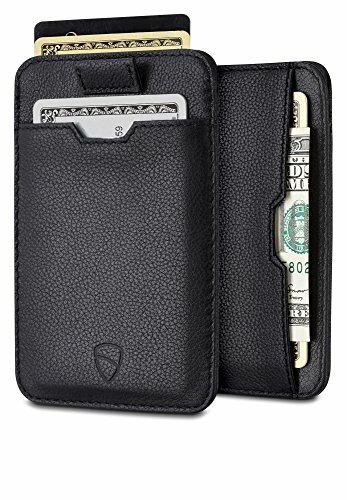 SLIM AND STYLISH – Made with the Finest Full Grain / Top Grain genuine leather, Designed Quick Access ID Windows, Best Fits 6-8 cards plus US bills with no bulk – Wallet Size: 4.4″ in. x 2.9″ in. .25″ in. Here is another rustic beauty. The Fly Hawk slim wallet is made from genuine Italian cowhide leather which gives it a proper old-school masculine look. The stitching is also very meticulously done, so the overall design of the wallet indicates that we are dealing with a top quality product. This wallet has been tested for RFID blocking. All cards operating in a 13.56 MHz frequency would be safely kept from the hands of thieves by it. That means that you would not have worry about someone stealing your ID, credit card, debit card, and driver’s license information. Other features of this compact minimalist wallet include a double bill compartment, 5 credit card slots, and a leather-framed ID window. The manufacturer was ready to admit that in the beginning, it is going to be tough to pull out your credit cards from their slots, but given time, the leather will stretch out just enough to alleviate the problem. Like all fair manufacturers, Fly Hawk promises a full refund or a free replacement in case you end up being unsatisfied with their wallet. It is always good to know that you are able to get your money back in case the product does not meet your expectations. There is nothing wrong with that. ITALIAN GENUINE COWHIDE LEATHER: Gift packaging, the best gift of choice.Design is USA,Tough stitching.Hand Made by professional artisans.a beautifully crafted wallet that will only get better with age.For the classic style, on first using it, cards might be a little tight putting in and taking out, but after use for a period , it’s eased up . RFID BLOCKING TESTED & APPROVED BY INDEPENDENT LAB TESTS. Our wallets have been tested for 13.56 MHz Frequency in which our credit cards, debit cards, driver license and ID cards operate. PLEASE BE NOTED THAT the signal of some ID badge, access cards and hotel room cards which operates in 80 KHz, can not be blocked by this wallet. PREMIUM FUNCTIONALITY: Our RFID wallet not only offers security, it’s also very functional. It’s Mini, you can hardly feel it!Perfect Front Pocket wallet to carry some money ID and a few cards,Top quality!Dimensions = 4″ 3.54″ 0.39″.Double bill compartment, 5 credit card slots, and 1 leather-framed ID window. SATISFACTION GUARANTEE: We know you’ll love our wallet, that’s why if you aren’t 100% satisfied we will provide you with a refund or a free replacement – which ever you prefer. Buy more for your friends and family. The Dopp Regatta 88 is one of the most minimalist wallets money could buy. 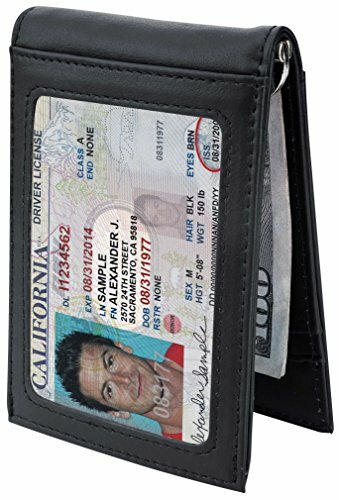 It is made from 100% genuine satin cowhide leather which secures this wallet a fairly long lifetime. Since we are talking about a slim wallet, it is as thin as they come, as well as incredibly compact. It easily fits the front pocket. Now, it does not provide much storing space, but it does provide enough for the bare essentials. You get 3 credit card slots, one utility pocket (which can store up to 3 cards), and an ID slot with a window. The ID slot requires you to put at least two cards in it because otherwise, it feels pretty loose. Also, the middle of the wallet serves as a money pocket. However, it does open up a lot more than it should. I am not sure that my cash would be safely kept in there. If ask me, there has to be a winner. Even though all of these minimalist wallets work wonders and are smartly and beautifully designed, only one can be the crown bearer. To me, the choice is very obvious. The Vaultskin Chelsea Slim Wallet is the creme de la creme. I believe that it is so important to have things that make you feel special. A travel wallet can be just a wallet, but it can also be a work of art, and I believe that the Vaultskin is a work of art. Still, it does not just look amazing. All the materials that were used to make it are also top-notch. Time and time again we have seen great looking products appear on the market, but they turn out to be completely unusable in real life. The Vaultskin will last. It is durable. It is irreplaceable. But putting high praise aside, this is a highly functional and practical slim wallet. It can carry as much as it can carry, so you are not able to overload it with unnecessary things. It provides the right amount of protection because it fits the front pocket and it includes RFID blocking. Within that confined space, you even are able to fit up to 10 credit cards as well as some cash. However, let us not forget that it is smart. The pull-strap which automatically retracts when you let go of it is the icing on the cake. You would not struggle to access your credit cards because of it, nor would you have to worry about putting them back. How cool is that? Honestly, no matter how great the other slim wallets may be, and they are great, the Vaultskin is just special.